alaTest has collected and analyzed 46 reviews of Acer Aspire Predator G7750. The average rating for this product is 2.6/5, compared to an average rating of 4.1/5 for other Desktops for all reviews. Reviewers are impressed by the usability. Some have doubts about the size and price. There are some mixed comments about the reliability and design. We analyzed user and expert ratings, product age and more factors. Compared to other Desktops the Acer Aspire Predator G7750 is awarded an overall alaScore™ of 84/100 = Very good quality. The Acer Aspire Predator AG7750-U2222 has class-leading performance, expandability, and features. Lots of connectivity ports, including two Ethernet ports. Easy drive expansion. Large hard drive, lots of memory. 3D and multimedia prowess. SLI-capable. 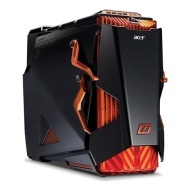 Distinctive design makes an unmistakable statement; strong gaming performance; overclocking potential; room to expand; front-panel hard-drive-bay access. Design not for everyone; getting inside the case means detaching the front face plate; no Blu-ray; weak online support. Last year, Acer officially bumped Dell from its status as the No. 2 PC maker in the world, and now Acer is hoping that its Predator can hunt down one of Dell's most prized brands: Alienware. Its stylishly intimidating exterior and solid productivity performance are certainly impressive, but the Acer Aspire Predator's gaming chops don't really live up to its lofty price tag. Acer is known for its budget laptops and desktops but at times it comes out with gadgets and devices that are aimed at people who can afford it. Very frustrating experience. Hope we get these working and never have to look back. Powerful machine for a great price.